size 27cm x 30 cm. In August 2012 an event occurred that was to change the perception of Malvern's springs and wells for ever. Dr. Bruce Osborne and Cora Weaver launched their new book detailing 130 sites of interest around the Malvern Hills. Previous publications by these authors such as Aquae Malvernensis (1994) and Springs, Spouts, Fountains and Holy Wells of the Malvern Hills (1992) (1997) (2001) had progressively detailed up to 88 sites as research and discovery of Malvern's historic waters progressed. Published by Phillimore, the book is hard back with dust cover, large quarto size with lavish illustrations and extended text. Celebrated Springs contains about 200 illustrations and well researched text over a similar number of pages, together with seven area maps to guide the explorer to the locations around the Malvern Hills. It also contains details on the long history of bottling water in the Malvern Hills. As such it is a 'must have' definitive guide to anyone with an interest in the Malvern Hills and Malvern Waters. 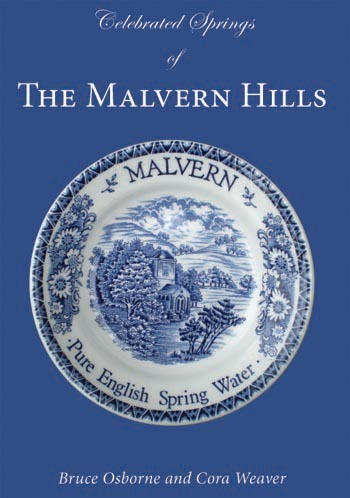 Celebrated Springs of the Malvern Hills is obtainable from bookshops in and around Malvern or direct from the authors at Cora's Great Malvern Bookshop on-line by clicking Website below.